Just look at how small that bottle is! 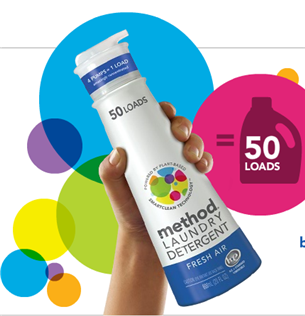 50 loads of clean laundry from that little thing. body wash, hand wash, dish soap, floor cleaner, etc, etc. etc. This one has to be the most genius of all. while juggling a 20-something pound 9 month-old without a blink! The pump works as a great pre-treater too. I've tried a few Method products and love them too, but have never heard of this one. I'm going to have to check it out!